Each morning I step outside to see how the flowers on this spike are progressing and have discovered their opening process is rather slow. 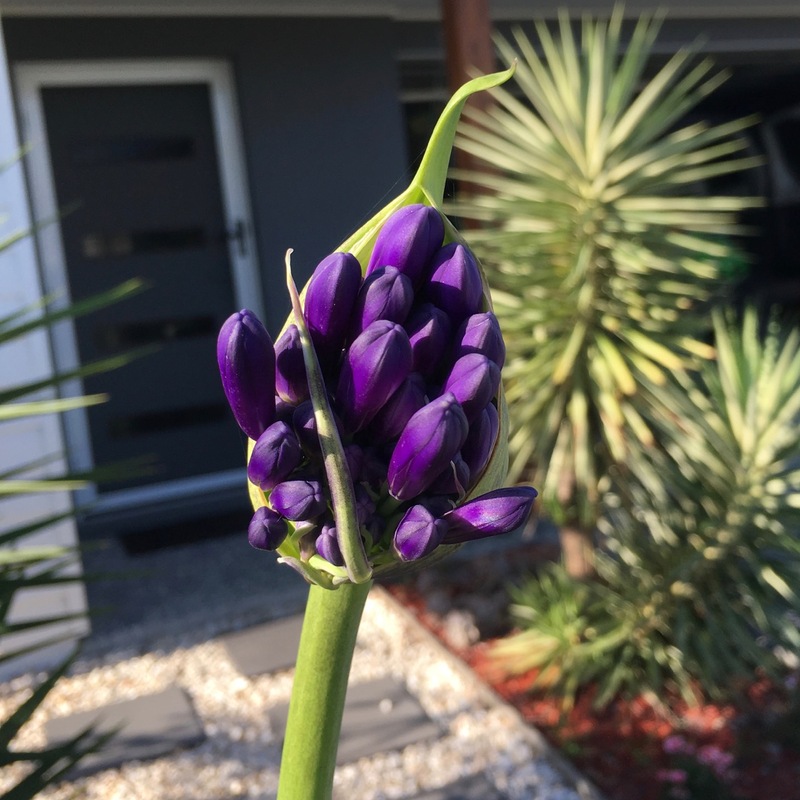 Have you ever paid attention to how long Agapanthus take to unfurl? Once opened, our eyes cannot help by notice the large, bright, garden pom-poms swaying (or not), but, and perhaps I’m just being impatient, I photographed the bud of this plant almost two weeks ago. Apaganthus belongs to the family Amaryllidaceae and the only genus of the subfamily Agapanthoideae. Their name comes from the Greek agape – “love” and anthos – “flower”. I think that’s lovely because to me that indicates that Agapanthus is the love flower – not to be confused with the ‘rose’ which is the flower of love. Originally native to southern Africa, Agapanthus has become naturalized in a few other places around the world, Australia included, and make for a stunning summer garden display. I know it’s not summer in Australia yet, but it will be in 21 days. Wow, the year has gone by quickly. Although Agapanthus is often called ‘Lily of the Nile’ as well as a wide variety of other lily-like names, it is not a lily at all, and yet, that doesn’t make the flower any less spectacular. I did say in my last post (That Time of Year) that I had several spikes in the garden. Alas, not one has fully opened, but that doesn’t stop them from attracting the bees. Not bad for quick snaps with my iPhone. 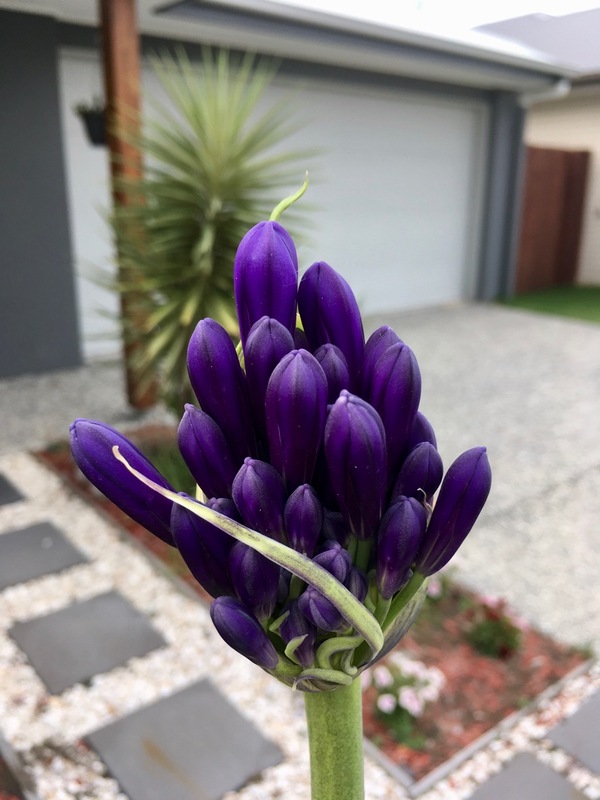 Agapanthus need full sun and regular water and I’ve always thought they perform at their best when shaded from the harshest of the midday sun, however, they grow well in temperate regions and can withstand heat and drought conditions. They’re great for edging a garden bed because there are dwarf varieties that grow to less than 50 cm high (less than 20 inches). Some people regard them as weeds. They’d have to be the prettiest weeds I’ve ever seen. My job now is to discover whether or not the species I have in my front garden is Black Magic, Purple Cloud, or Purple Fountain. Stay tuned. * These photos were taken with my iPhone. It’s not the latest model available (it’s rather old actually) and I’m really impressed with the quality. I never thought about it that way Debbie. Certainly I’ve now had ample time to fully appreciate the blooming process.